Some people just don't like change. Less than a week after Digg released version 4 of its social news-sharing site, fans have rebelled, flooding Digg with links from a rival sharing site, staging a "Quit Digg Day," and prophesying a major drop-off in traffic if the site doesn't return to its roots. Has Digg dug its grave, or is this yet another kneejerk neophobic reaction? The default setting of "My News"
Digg founder Kevin Rose addressed these and other gripes -- like changes to the color scheme and text boxes that can't be re-sized (which remind me of the petty squabbles about Google's recent face lift attempt) on his blog. Rose offered solutions to most issues by promising bug-fixes, updates and enhanced customization. 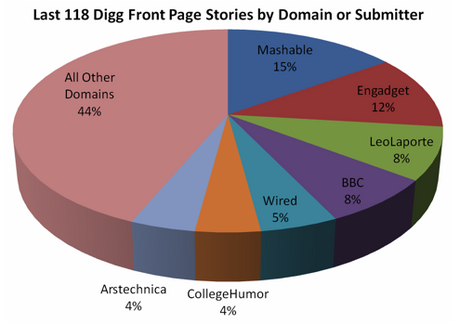 The most contentious issue was about high-profile news sites dominating (and seemingly controlling) the Digg.com front page. Social media site Soshable complained only 6 major publishers (such as BBC, Engadget, Wired and College Humor) and one celebrity (Leo Laporte) dominated Digg's homepage for a three day period. The Huffington Post made its own chiding graphic (see below) echoing the same complaint. "All diggs are still equal, nothing has changed there. Our directory of recommended users will eventually open to the entire world. We will sort users, not on popularity (followers), but based on how good you are at finding/digging content (similar to wefollow.com). This will remove the popularity contest and put the focus on quality diggers." "Digg v4 breaks that covenant. Despite what Rose, his team, and their beloved mainstream celebrity buddies believe, the people do not have the power right now. The power has been given to corporate level blogs and Kevin's select-few buddies who, for some strange reason, Rose feels he needs to appease to be successful." Digg's apparent devotion to big-name sites would be in direct conflict with a statement Rose made in 2008 promising that Digg would "do better" and be more accessible to niche interests. At the time Rose said Digg engineers would focus on ways to link users with similar interests and create tools that allow them to share news that's not necessarily of broad general interest. The anti-v4 battled raged on. Digg users popularized by voting for blogs demanding that Rose "do the right thing" and return Digg to its roots. The Twitter hashtag #diggrevolt has been trending high, suggesting that dissatisfaction with Digg isn't just smoldering among a vocal minority of its users. Perhaps the biggest pushback came when users flooded Digg with links to Digg's main competitor: Reddit. Reddit took advantage of its new found popularity and published a Reddit 101 guide for new users. In response to the Reddit push, Digg froze manual story submissions, though that ban has since been lifted. According to site-tracker Alexa.com, Digg traffic plummeted 33 percent, overnight. Time will tell if the drop was more than just a fluke or part of an overall trend. It also appears that Andy Sorcini, aka MrBabyMan, one of Digg's top users, warned of this backlash in March while testing the Alpha version of Digg's update. Though Rose is still on the defensive, and has said that Digg v4 won't go away, he's willing to compromise. He told TechCrunch that Digg will "stick with" v4 but will soon bring "Digg v3 functionality" to the Digg v4 backend. If it sounds like everybody and their mother is anti-Digg, fear not -- there are many people still on Digg's side. Ryan Block, co-founder of the technology-buying community gdgt, tweeted "So lame and petty how a subset of bitchy Digg users are hijacking the site. There is just no pleasing those kinds of denizens." Can Digg and Rose weather this storm? Or is this another flash in the pan that will go away as soon as the Internet finds something else to complain about, like another Facebook modification? Rose recently tweeted that this was "revolt #5," indicating it was no big deal. Indeed, Digg has felt the brunt of user anger before, and I have a feeling that this too shall pass. But it serves as a helpful reminder: the Internet hates change when it comes to social media sites. 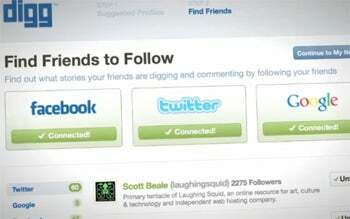 Kevin Rose and Facebook co-founder Mark Zuckerberg know this all too well.